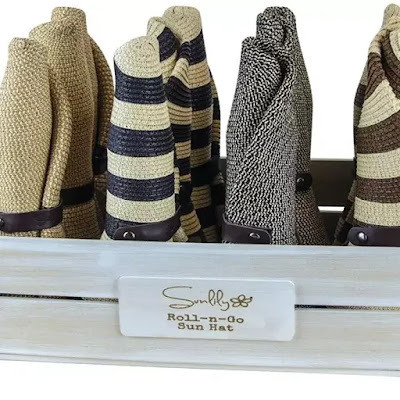 Now through 5/6, or until they sell out, choose from these Sunlily Roll-n-Go Sun Hats for ONLY $9.99 (Retail $49.99)! Sun hats are difficult to travel with. They tend to be misshapen and wrinkled once you get to where you're going. They never pack well flat. But wait, now there's a solution. Just roll - snap - go with the new Roll-n-Go Sun Hat. A revolutionary design that allows you to roll the sun hat tight so it's easy to pack. The braided leatherette roll strap with snap also doubles as a decorative addition. Four classic styles and free knock-down display with the opening order. It's a snap!